CDR: BIG TURNOUT AT ACHEMA 2018! From 11 to 15 June in Frankfurt took place ACHEMA Expo, one of the biggest tradeshow dedicated to the industrial sector. CDR joined Achema 2018 as a main exhibitor, with his own booth. During this fair, Frankfurt becomes the main venue for all the innovative equipments and processes for the chemical, pharmaceutical and food industry. More than 3,700 exhibitors, from 55 different countries, show their products to over 145,000 visitors. And of course CDR took the main stage. We introduced the new 2018 mag-driven pumps: XTS and XTN. An all made in Italy success, started from the idea of ​​developing an innovative solution, capable of handling suspended solids in high concentration and with a considerable dimension, without using external filters. The prototypes generated excellent results in terms of reliability and performances, so the production started immediately. A real revolution on the market: up at present, nothing similar exist. 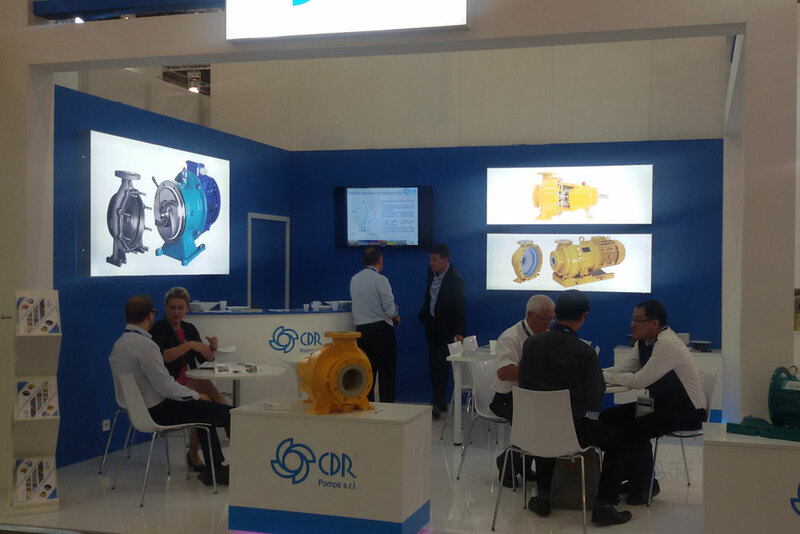 Besides these two brand new products, the visitors who populated the stand also were keen about UTN and UTS pumps, lined and metallic centrifugal pumps, both in mag-drive configuration and suitable for heavy duty services. Despite the reference market is mainly italian, the new pumps XTN and XTN have aroused interest also among european markets (Germany in particularly) and overseas (USA, Asia and India) for chemical, petrochemical and pharmaceutical purposes. In conclusion, we received very good feedback from these five days of exhibition, and we would like to thanks all the people that have passed by our stand, giving us the opportunity to explain our solutions, or just have a friendly chat. As we believe it’s important to celebrate success, but also wrong to rest on our laurels, we are already back to work, planning the next innovations. Stay tuned as there is more to come!